- So yeah, I understand the writers didn't care about making this show very militaristic, but come on... letting Boxey just barge into the bridge of an aircraft carrier in space? - This episode establishes that the cardgame the colonials play is called Pyramid. - Boxey beating Starbuck at cards. - Apollo confronting Redeye in the bar. This episode is kind of the showcase for everything that was good about BSG and everything that was bad about BSG in a single episode. This episode did many things well. For one, Redeye was fascinating. A Cylon with his memory wiped, who can be reprogrammed by the first person to respond to his statement of "by your command" certainly is a valuable resource for a planet with limited technology. Additionally, the western theme of the episode was very successful, the acting was great, and the plot flowed well. Unfortunately, despite this episode being well done, it had all the common problems BSG perpetuated as well. First, let's talk about that planet. Why is Galactica near yet another habitable planet? It seems like they're stumbling on a new one every week! Who needs Earth when every week you find an Earth-like planet? Second, who are the people on this planet? They're not very well connected to the twelve colonies, so where did they come from? The history and culture of these people should have been developed more. Finally, it is becoming clear that a better title for BSG 1978 would be "the adventures of Apollo and Starbuck." It seems every week is an excuse to put one or both of these characters in a new dangerous situation, largely ignoring the fleet its troubles. You should notice though that my criticisms about this episode are not particularly severe. While there are things I would have preferred to have seen or had clarified, the episode is fairly solid, moreso than the average BSG 1978 episode. But at the same time, while the episode is solid, it does not manage to live up to anything more than average by overall television standards. Sadly, "average" by television standards is actually above BSG 1978's average offering. A card game was shown in the first or second episode I believe and the name "Pyramid" was mentioned. 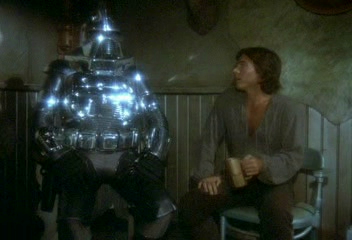 Also, it's unfortunate that the Cylon Centurion attacking Boxey in episode 1x03 wasn't a bit more successful. The child and the dog thing (chimp in a suit) were completely unnecessary to the show and only served to provide an annoyance. The various human settlements encountered by the Galactica are stragglers or others who, for various reasons, either got left behind by the original migration from Kobol or decided to leave the migration and settle on these planets. The technology varies because some of them have devolved technologically over the yahrens, for various reasons, or just haven't advanced as far. Keep in mind, most of them are still more advanced than Earth is when Galactica finally finds it in Galactica 1980. Why they didn't stop and settle on one of them? They were still being pursued by the Cylons. Apollo mentions it himself, in one episode, they haven't stopped because they haven't felt they were strong enough to stop, colonize, and defend themselves should the Cylons find them. BTW, the reason they recycle the viper dogfights is budgetary. These effects were VERY advanced for 1970s special effects technology. They simply couldn't afford to keep making new ones. They also recycle the same old shuttle transit scene every time someone travels from the Galactica to one of the fleet ships.